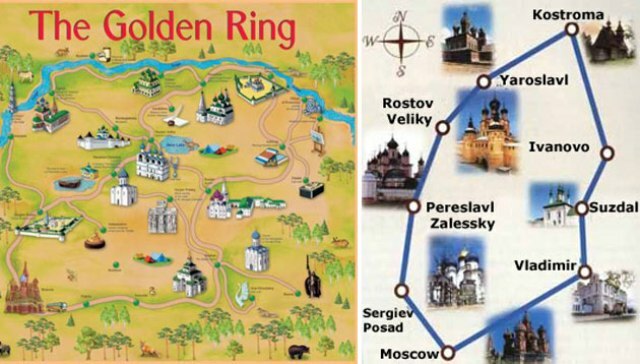 The Golden Ring is a traditional tourist route which comprises a chain of old Russian towns located northeast of Moscow where the events that shaped early Russian history occurred. The whitewashed walls of these once-fortified cities still stand; the golden spires and onion domes still mark the horizon; bells ring out from towering belfries. The Golden Ring is among Russia's most enchanting destinations. Each town of the Golden Ring is easily accessible by road from Moscow and has well developed tourist infrastructure: hotels, restaurants, parking, etc. There is no clearly defined list of towns which comprise the Golden Ring. Big cities like Kostroma, Yaroslavl and Vladimir have pages of their own. 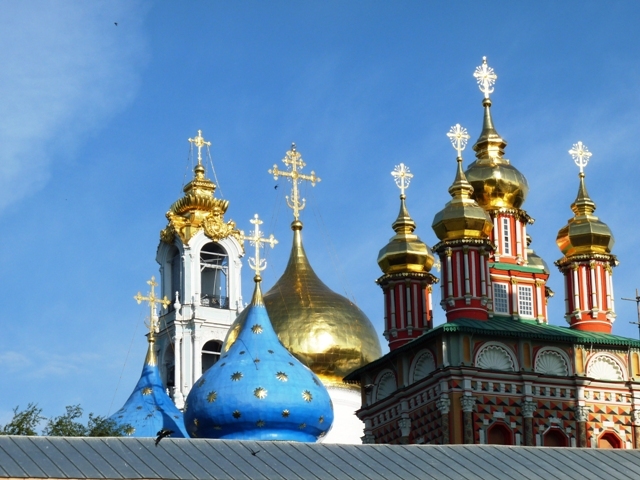 Here I post images of smaller towns – Sergiev Posad, Murom and Uglich. 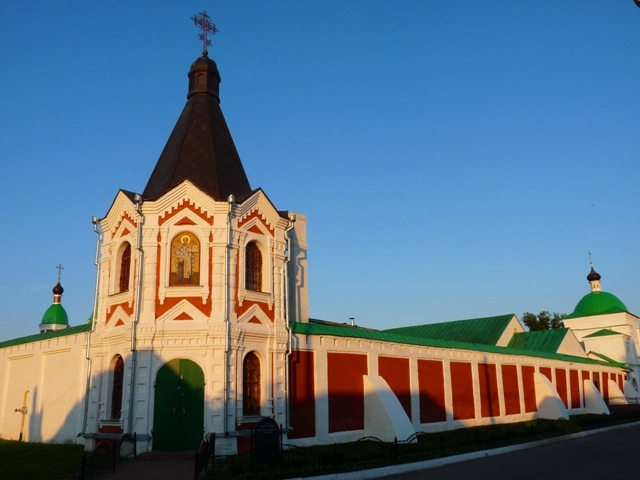 On driving 40 km south of Pereslavl or 60 km north from Moscow a car traveler comes to perhaps the major link of the Golden Ring - Sergiev Posad. 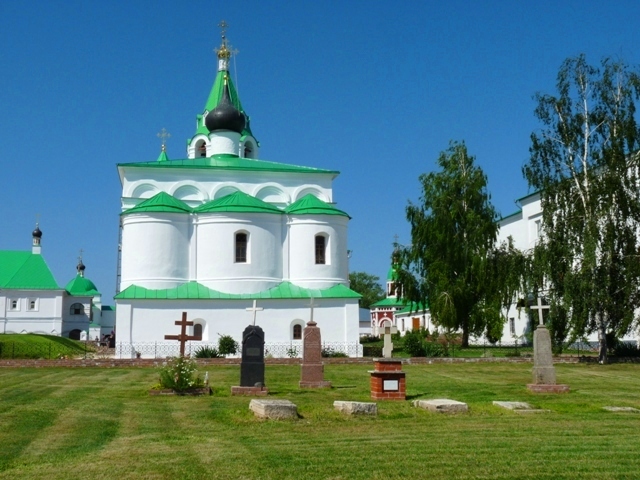 The local Trinity Monastery was founded in 1340 by St. Sergius of Radonezh patron saint of all Russia. 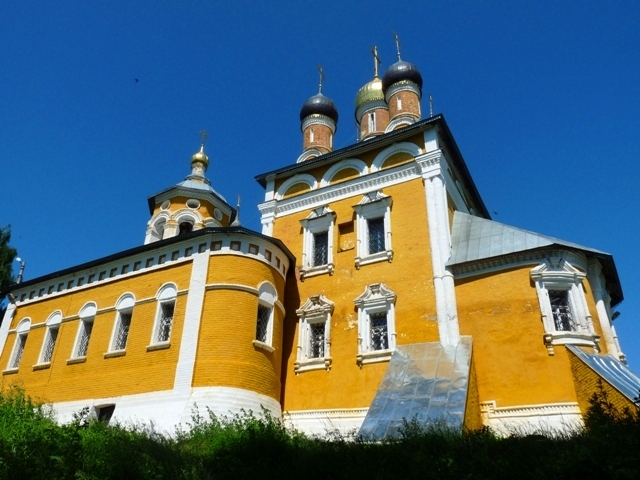 Today the monastery is one of the most important and active in Russia. 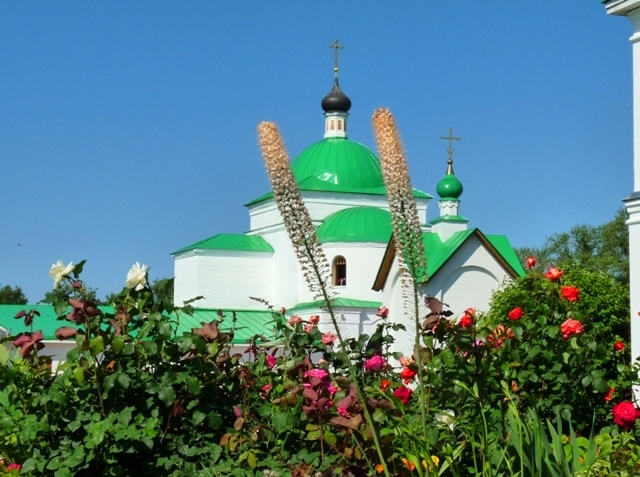 It is the spiritual center of Russian Orthodoxy which has a sizable population of monks. 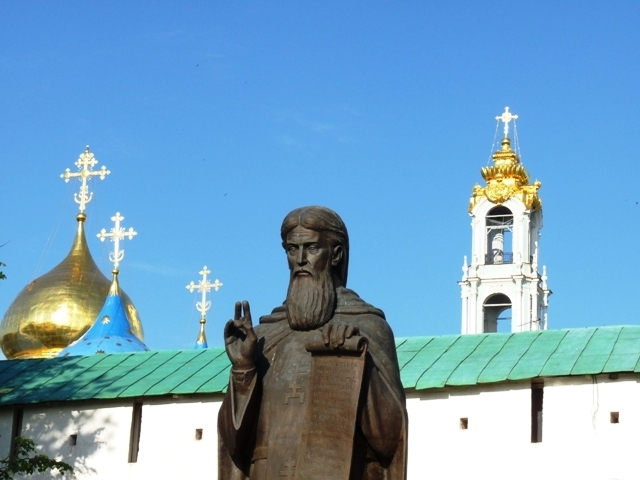 Since the 14th century, pilgrims have been journeying to this place to pay homage to St.Sergius. 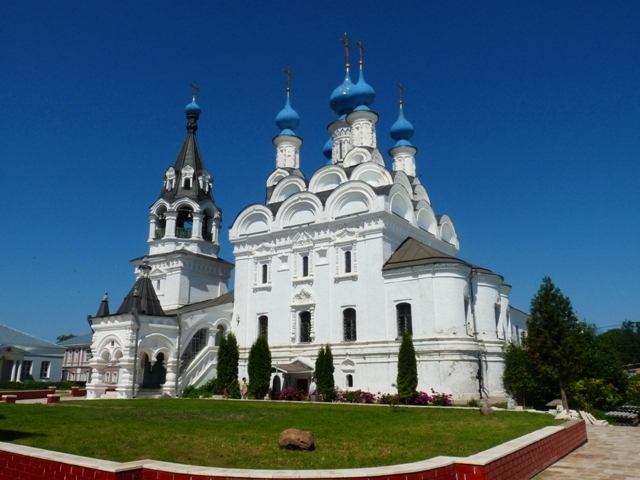 The Trinity Cathedral built in 1420s is the heart of the Trinity Monastery. It houses the tomb of St.Sergius where a memorial service for St.Sergius goes on all day, every day. The interior, lit by oil lamps, is largely the work of the great medieval painter Andrei Rublyov. 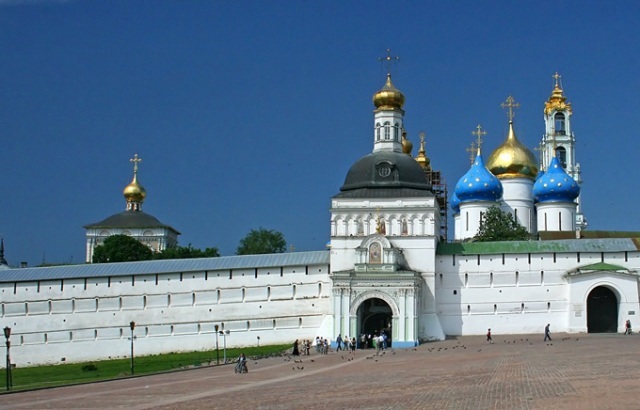 The star-spangled Assumption Cathedral was finished in 1585 with money donated by Ivan the Terrible in a fit of remorse for killing his son. The five-tier baroque bell tower took 30 years to build in the 18th century and once had 42 bells the largest of which weighed 65 tonnes. Murom was first mentioned in chronicles in 862. For more than 300 years it was the capital of a separate principality. The town is known to every Russian kid as the birthplace of the most celebrated East Slavic epic hero and character of many fairy tales - Ilya Muromets. 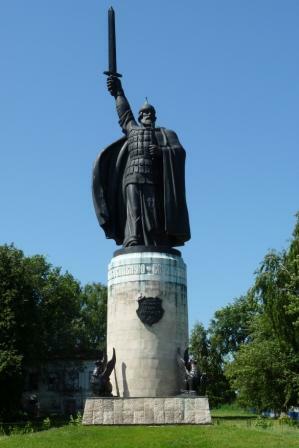 The statue of Ilya welcomes travelers entering the town on the southern end. 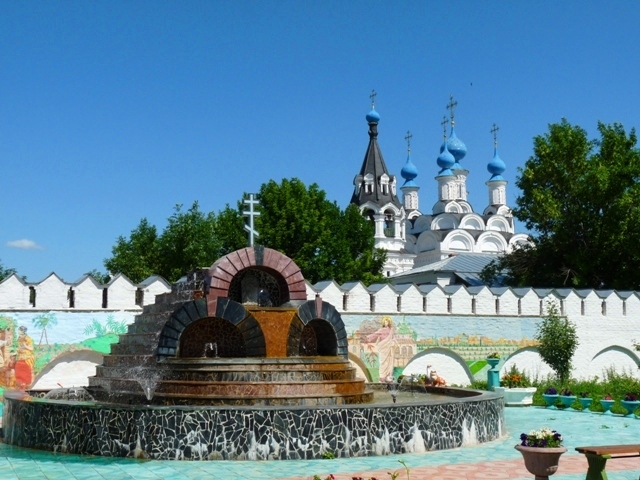 Locals boast that Murom is among the prettiest towns of Russia. Russian writer Maxim Gorky wrote "Whoever has not seen Murom from the Oka River, has not seen Russian beauty". The town is littered with 16-18th century churches. 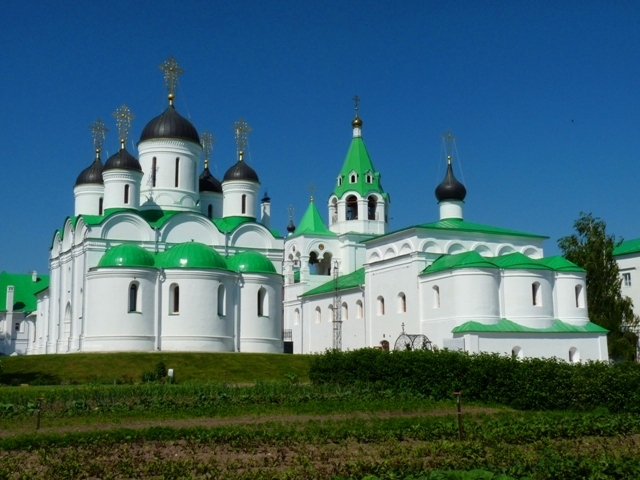 The Saviour Monastery is one of the oldest in Russia was founded in 1096. 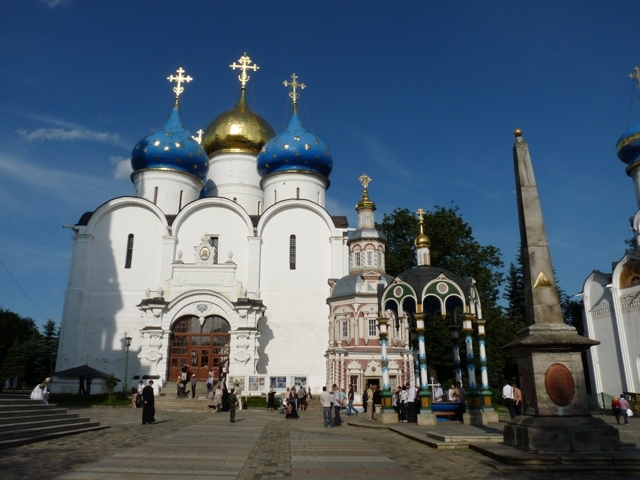 The elegant Transfiguration Cathedral was built in 1552 and just recently restored. The Trinity convent and the Annuciation Friary are separated by a narrow road. Both built in the 17th century. 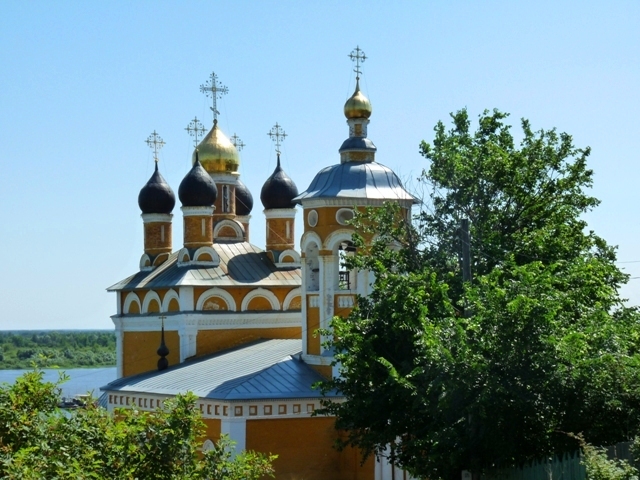 The acid-yellow Wet Nicholas Temple stands right on the bank of the Oka River. The name indicates its closeness to the water. The temple first mentioned in 1566 was built in stone in early 1700s. Uglich is a quaint town on the Volga River 80 km from Rostov Veliky. Here the son of Ivan the Terrible Dmitry was murdered in 1591, probably on the orders of Boris Godunov. Within the riverside kremlin the star spangled Church of St. Dmitry-on-Blood was built in 1690s on the spot where the body was found. The interior is decorated with bright frescoes and the bell that was used to mourn Dmitry's death. In 1591 the bell rang to call people to rebel against Godunov over the murder of young Dmitry. In response Boris Godunov ordered the bell to be publicly flogged and detongued before it was banished for many years to the Siberian town of Tobolsk. 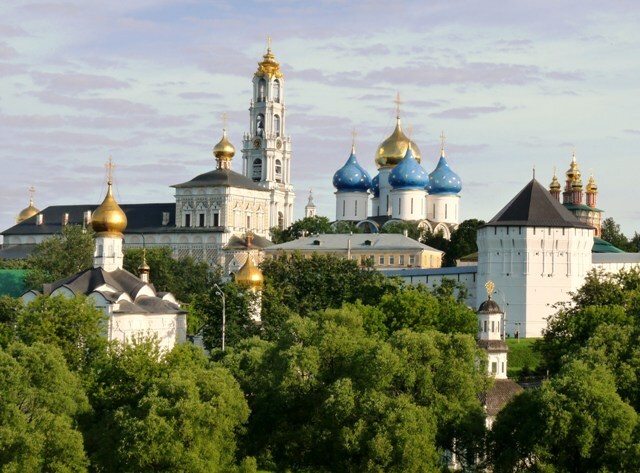 The impressive five-domed Transfiguration Cathedral is also in the kremlin.